We are three full weeks through the 2017 season. Most teams have played around 18 games, about 1/9th of the season. Honestly you can't evaluate much from that small of a sample, but it's fun to try. In this post, I'm going to use run differential to categorize teams under a fast food chain. First, though, let's take a look at the 2016 standings through this point in the season. 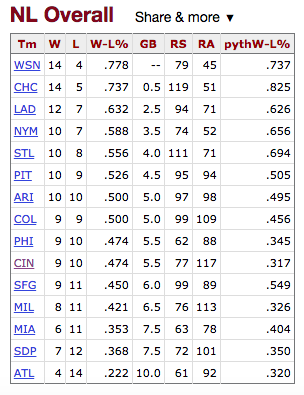 The first thing I noticed is the White Sox and Royals had the two highest run differentials in the AL at this point. They both went on to miss the playoffs pretty easily. The 2016 playoff teams had the following run differentials: +14, +9, +1, 0, +9, +68 (#Cubs), +34, +23, +22, +10. So, you can't really make the playoffs in April, but you can make it very hard on yourself (Astros). The dominant teams also revealed themselves early on, especially in the NL. Using current run differential numbers, these are how I see teams standing right now. Forgive my lack of explanations, but I'm also editing episode 90 of our podcast that comes out tomorrow. You should subscribe.